Trimming large phoenix palm trees is quick and efficient with our palm trimming platform! Whether you are looking to encourage growth through expert pruning, maintain and trim palms or are looking for total palm removal in Whangarei District, Dargaville or the Bay of Islands, Symbiosis Tree Services are the experts across Northland. Palm gardens are beautiful when properly maintained. Neglected however they quickly become a headache. Whether you are looking for complete palm removal or are looking to encourage a controlled growth through palm trimming, you can be confident that our expertise, customer service and value cannot be beaten. 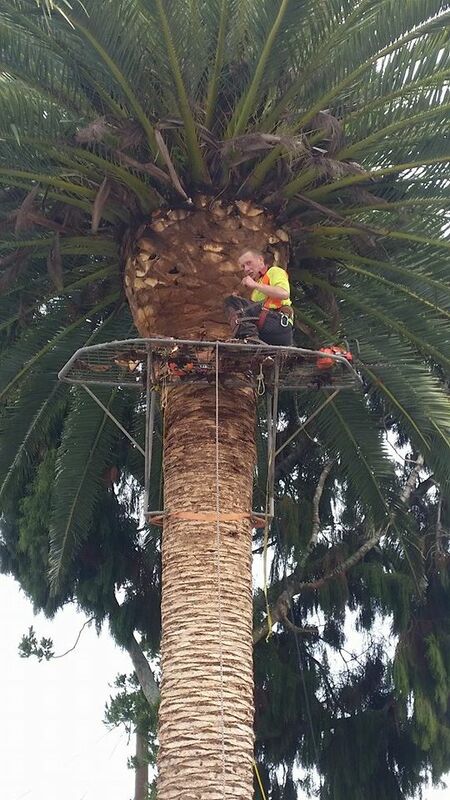 As Whangarei’s palm trimming experts, we are experienced in working with each of the Northland regions most common palm species; Phoenix, Washingtonia, Queen, Fan and Bungalow Palms and Nikau. The pineapple is actually not ideal for the for palm gardens. Palms should have large, healthy crowns Many palms actually do not need trimming but instead require correct spraying or fertilisation. Many species are best left to manage themselves. We will be able to determine the best approach for your palms, resting on decades of professional experience. If give us a buzz, obligation free. Sometimes, the best, and only course of action is complete palm removal. Palms can swiftly become spectacularly out of control, especially the vast, spine covered Phoenix Palm or towering washingtonia palms. Complete palm removal can be dangerous for life and asset. With years of expert knowledge as well as all the required equipment, we will be able to swiftly, cleanly and completely remove your palm problem.